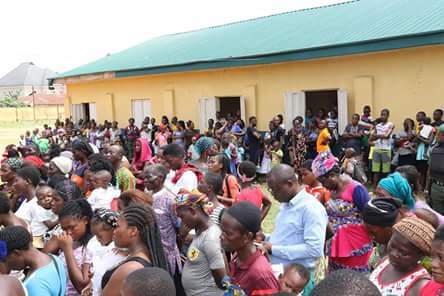 In a bid to assuage the predicaments of Internally Displaced Persons (IDPs) as a result of the current flooding in parts of Delta state, wife of the state Governor and founder of 05 Initiative, Dame Edith Okowa has presented relief items to IDPs camps in the state. Although, the action was complementary to that of the state government, corporate organizations, politicians and public spirited individuals, the 05 Initiative’s humanitarian gesture stands out because of the genuine, exemplary and sustainable posture of the Non-Governmental Organization. At Onneh Primary School and 0gbe Afor Primary School in Asaba, Dame Okowa who arrived the camps with various food items, ranging from bags of rice, bags of Garri, tubers of yam and many other items sourced by the 05 Initiative, encouraged the internally displaced persons to continue to maintain peace and order as well as avail themselves with the free skill acquisition schemes in the camps. 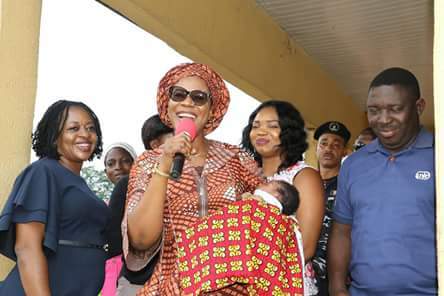 At 0gbe Afor camp clinic, the governor’s wife donated baby bed, packs and other items to a nursing woman who delivered on arrival at the camp. Dame 0kowa who inspected the cooking apartments and rooms commended the unity of the people and advised them to sustain the prevailing peace and order by channeling complaints to the Camp commandant. She was accompanied on the visit by the Commissioner for Special Duties, Barr. Ernest Ogwezzy, Commissioner for Health, Dr Ononye Mordi, former state PDP Chairman, Chief Edwin Uzor, Director General of 05 Initiative, Mrs 0ghenekevwe Agas, wife of Oshimili South local government area, Mrs 0sadebe among others. The Internally Displaced Persons (IDPs) were brought to the camps from different parts of 0shimili South and its environs, especially 0ko-Anala, Aamakom 0gbele, 0biokpu, Power Line phase one and two, 0gbe-0fu phase One and two. Meanwhile, the Commissioner for Special Duties, Barr Ernest 0gwezzy, who announced the resumption of both primary and secondary schools teaching at the camps, thanked the governor’s wife for her humanitarian prowess and urged others to emulate her philanthropic gestures in affecting lives of Deltans.